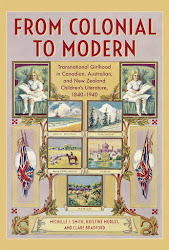 After a return journey from hell, I'm now back from Canada and the girls' texts and cultures symposium in Winnipeg. As someone who studies inanimate texts that do not speak back, it was a real revelation to hear researchers who work with actual girls speaking. One paper ended with a video edit of The Lion, the Witch and the Wardrobe with a love song spliced over the top to suggest a kind of love plot between Lucy and Mr Tumnus. Immediately, I was reminded of the relationship between Johnny Depp's Mad Hatter and Alice in the recent Tim Burton film adaptation of Alice in Wonderland. While the film made a connection between the Hatter and Alice's deceased father through their mutual fascination with things outside the "normal" range of thought, the tension generated when Alice must decide whether to remain in Underland or return home seems much greater than that of a girl who must leave a friend behind. On the part of both the Hatter and Alice, there seemed to be a romantic interest that made the decision all the more poignant. On the long flight from Vancouver to Sydney, the paucity of movie choices gave me the opportunity to find another filmic girl who is placed within a romantic relationship with a man. In the 80s classic Labyrinth (directed by Jim Henson), the fifteen-year-old heroine Sarah must rescue her baby brother from the goblin king, Jareth, who is disturbingly played by David Bowie, replete with backcombed hair and a codpiece. She must do this before the thirteenth hour or her brother will become a goblin, and she'll presumably be struck from babysitting club membership across the nation. As part of Jareth's attempts to prevent Sarah from reaching his castle by way of the labyrinth and rescuing her brother, he enters her hallucination of a masquerade ball (though both are unmasked). Sarah suddenly looks a lot older than she has throughout the film, with her hair elegantly styled and a face full of make-up. 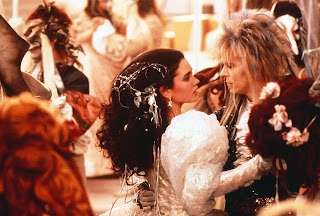 Jareth attempts to prevent Sarah from moving forward in her quest by dancing with her, and the scene again seems to show a girl desiring a man, or at least the idea of one, as she is temporarily transfixed by the spell of the ball and Jareth. I'm not sure whether there are other examples, and the Lucy/Mr Tumnus one is a stretch (although I did feel a little uneasy with Mr Tumnus on first viewing the film as he seemed lecherous to me! ), but with all the paranoia about paedophilia in contemporary culture it seems interesting to see at least a few very popular films that acknowledge the possibility of a girl desiring someone who is an inappropriate love interest. Perhaps it is a part of the demonstration of the girls acquiring maturity that they are shown as having the capacity for romantic interest in men, and the quick return to the normal world outside of fantasy lands leaves any conflict between social norms and the girls' feelings behind? I suppose it is an awkward reality that girls often experience sexual desires before boys their own age have matured and hence desires are projected on to much older pop culture idols, in what is usually only ever a fantasised relationship. Perhaps that's why these girl/man tensions turn up in fantasy films, as they'd be too awkward to contemplate in realist ones.